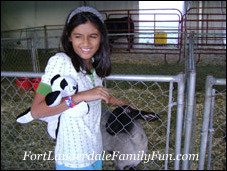 Fair food, lots of thrilling rides and farm animals? Let's go! 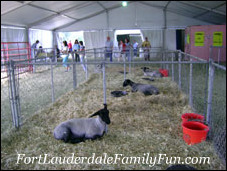 The Broward County Fair is an exciting event for families to go to. It’s usually scheduled for 10 days around Thanksgiving, making it a perfect treat to take the family to just before the craziness of the end-of-the-year holiday celebrations. The tickets are fairly priced and can be a good value. 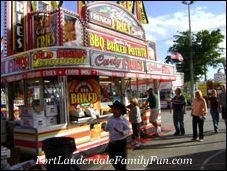 A Walk Around ticket is just that – just walk around the fairgrounds and enjoy the sights, the atmosphere, the farm animals and the 4H presentations, but if you want to go on the rides then separate tickets have to be paid for. 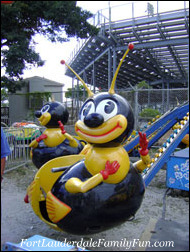 The rides sometimes cost 2 tickets per ride or can go to 5 tickets or higher depending on the how complicated the ride is. Of course, the more exciting rides cost the most. The Walk Around ticket costs about $10 each person. Children 6-12 years cost less and 5 years old and younger are free. Then there’s the Super Deal ticket at about $30 per person. It sounds like a lot at first. That’s $120 for one day admission for a family of four not counting food and, of course, the souvenirs. 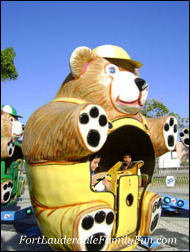 But it turns out to be a very good deal because along with full access to the fairgrounds, it will also allow you to get on all the mechanical rides for free for as many times as you want. 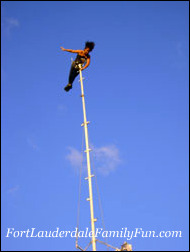 Some rides cost more though – like with bungee jumping, for example – so expect to pay a bit extra for those special ones. 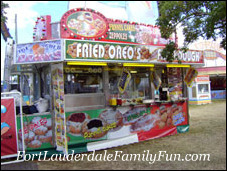 So what can you do at the Broward County Fair? There are colorful roller coasters and rides that are just fast enough and go high enough that will suit the smaller kids. 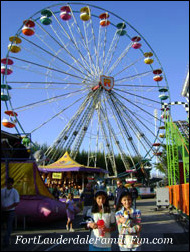 Then there’s the Ferris wheel that’s a mainstay of all county fairs everywhere. If you’re brave and want to go really fast, upwards, downwards and around then you can go on the really fast and scary rides! But many people are more and more health conscious these days. I’ve noticed lighter fair like salads and fruit, plus there’s also a good variety of food choices. I’ve seen arepas being sold. These warm corn cakes filled with cheese has it’s origins in Latin America. It’s also not uncommon to find a stand selling Greek gyros in pita bread and fresh salads with black olives and feta cheese. 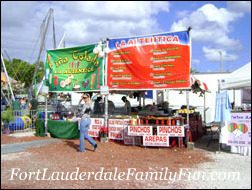 But what’s a county fair without pink and blue cotton candy, sticky and sweet kettle corn and mega-large Cokes? 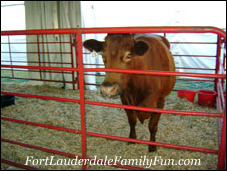 What else is there to do at the Broward County Fair? 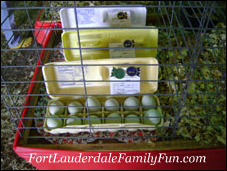 Have a look at the farm animals! 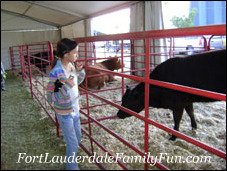 The agricultural shows are at the heart of the fair and it’s really educational for everyone to see the different animals being shown here. It also reminds us on where our food is grown. 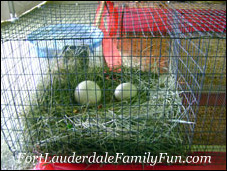 This is an entry for green eggs…seriously they are green! And it looks like it received some kind of prize! Don’t forget to see one of the shows. There are beauty pageants and singing contests, too! Here are some photos of the Fearless Flores. 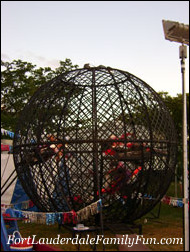 They do acrobatic acts several feet above the ground and then they go on their motorcycles and ride in a metal cage called the Globe of Death. Yikes! 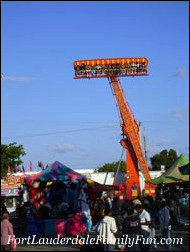 It is always fun at the Broward County Fair – make sure you make it this year!